You&apos;ve already heard insights on the Nike KD VI from designer Leo Chang and the man himself, and now Durant and the Swoosh have officially launched the signature model. Last week, Durant visited his hometown of Seat Pleasant, Maryland, where the team behind the KD VI participated in a panel at the area&apos;s rec center. But Durant didn&apos;t stop there, he also took the media on a tour of Seat Pleasant which included stops at his grandmother&apos;s house, outdoor courts where he played as a youth, an infamous hill which he&apos;s run over 1,000 times, and his favorite local restaurant. 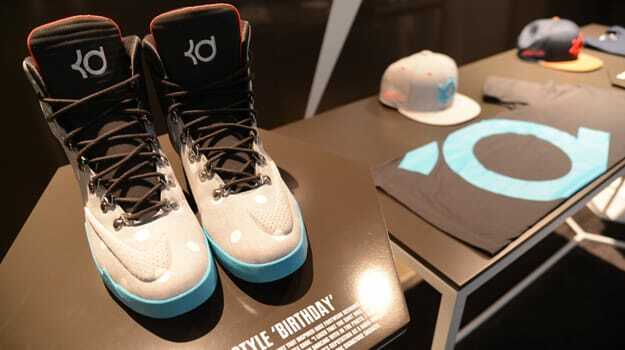 The KD VI line includes the latest Durant signature model, but is also loaded with performance apparel and lifestyle gear. The low-cut KDVI officially releases tomorrow, July 3, in a special "Seat Pleasant" colorway. Check out the video below for more on Durant&apos;s visit and stick with Sneaker Report for updates on the Nike KD VI.